After deciding to cut back on gluten and dairy, I am on a mission to find snack foods that are better for me than the normal salty, fat-ridden things I usually go for. While looking around at Natural Grocers today, I found these. They are called Plentils. 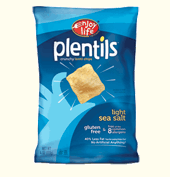 They come in several flavors, but I chose the light sea salt variety. They taste really good! And I don't mean they taste good for a health food. I mean they really taste good- addictive, in fact. I can't wait to go back and try some of the other flavors. If you want information about them, visit their website and find a store near you. If you can't find one, you can order them online!